Peterbilt Motors Company announces an increase in production of the new Model 382 at the Peterbilt truck manufacturing facility in Denton, TX. The new Model 382 offers outstanding maneuverability, aerodynamic efficiency, and exceptional serviceability for shorter haul pick-up, delivery and diminishing load markets. 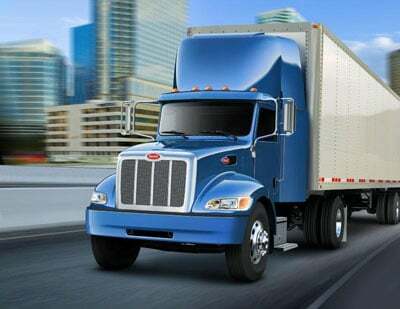 “Optimized safety and steering capabilities for congested areas, advanced aerodynamics for excellent fuel efficiency and serviceability for lower operating costs makes the Model 382 the ultimate vehicle for the short and regional haul markets” Bill Jackson, Peterbilt general manager and PACCAR vice president. “Having delivered the first Model 382 to Columbia Distributing in December, we are excited to increase production of this vehicle delivering customers ideal performance and savings.” Driver comfort and safety are built into the Model 382 with a cab specifically designed to meet the needs of the driver. The sloped hood of the Model 382 provides optimal visibility and a technologically advanced forward-lighting system produces both a broader and brighter lighted area. With back-lit gauges, contoured door panels, and rocker switches placed within easy reach, everything in the driver’s operating environment is ergonomically designed to keep the driver alert, comfortable and productive. The HVAC system offers improved air flow, but also reduces maintenance costs. Power windows, mirrors and lock switches are located in the new door pad design and dual cup holders provide added convenience. The new Model 382 is powered by a highly efficient 2010 Cummins ISL9 engine which has one of the highest power-to-weight ratios in its class with heavy-duty features like replaceable wet liners. An improved Electronic Control Module (ECM) and improved air flow allows the ISL9 to run stronger and with greater responsiveness than previous engines. Ratings range from 345-380 hp with a maximum 1300 lb-ft of torque.